The leaders of the two Koreas on Friday jointly participated in special events embodying hopes for peace on the Korean Peninsula, adding to the sentiment of a thaw in inter-Korean relations. An array of ceremonies, mostly reflecting traditional Korean culture or the integration of elements of the divided Koreas, were held throughout the day. After North Korean leader Kim Jong-un crossed the border, the traditional folk tune of “Arirang” kicked off the first ceremony of the day as President Moon Jae-in and Kim inspected a South Korean military honor guard. Kim then proceeded to greet the South Korean summit delegation, which was followed by Moon’s exchange of handshakes with the North Korean officials. An impromptu photo session of the leaders and members of their delegations was held after the exchange. At around 4:30 p.m., President Moon and North Korean leader Kim Jong-un planted a pine tree on the military demarcation line bisecting the two Koreas, according to Cheong Wa Dae. The selected tree was germinated in 1953, the same year the armistice agreement was signed, ending the 1950-53 Korean War in a cease-fire. The ceremony was carried out at South Korea’s request, which was accepted by the North. Moon and Kim shoveled soil collected from the South’s Hallasan on Jeju Island and the North’s Baekdusan -- which are the highest mountains in the two countries -- onto the tree. The North Korean leader’s sister Kim Yo-jong, who came as a member of the summit delegation, aided Kim in the ceremony by handing him the necessary equipment for each step. Kim then poured water from the Han River of the South, while Moon mirrored the move with water from the North’s Daedong River. A stone inscribed with the names of the two leaders and the phrase “Plant peace and prosperity,” installed in front of the tree, was unveiled. A similar event was held at the 2007 summit in Pyongyang when then-South Korean President Roh Moo-hyun crossed the border to meet Kim Jong-un’s father and predecessor Kim Jong-il. 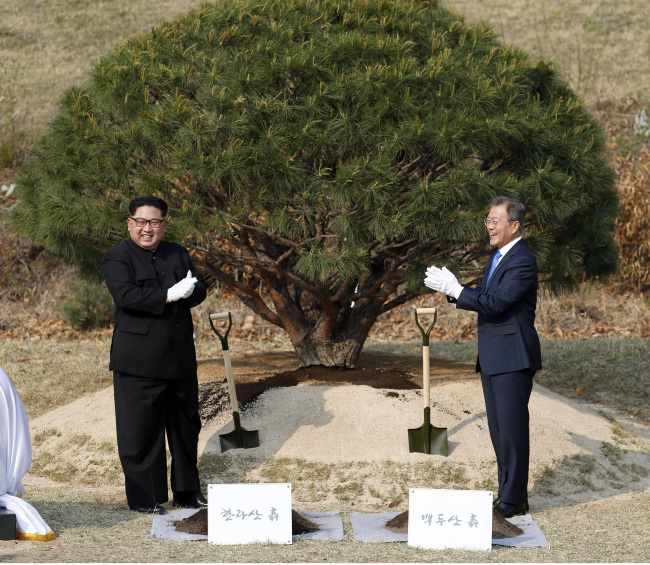 But it was Kim Yong-nam, the North’s nominal head of state, who jointly planted the tree instead of Kim Jong-il. The pine tree was planted near the road used by the late founder of Hyundai Group Chung Ju-yung when he led truckloads of 500 cows to the North in the late 1990s. North Korea was believed to be suffering from a severe famine at the time. Due to its symbolic significance, Panmunjeom has often served as venue for cross-border events symbolizing a thaw between the divided Koreas. Before wrapping up the day, the two leaders attended a banquet held at the Peace House located in the South’s side of Panmunjeom. Kim Jong-un’s wife Ri Sol-ju arrived at the border at 6:15 p.m. to join the banquet, which was also attended by South Korea’s first lady Kim Jung-sook.